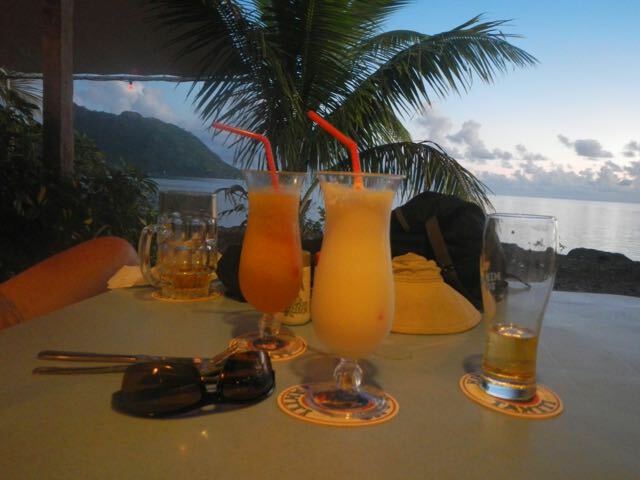 We fell in love with Huahine last year and decided to return and see more of it. Huahine is called Le Isle Sauvage (the Wild Island) locally and is delightfully rural and non-touristic. There are about 6,400 inhabitants who live a laid-back and fairly agrarian lifestyle. 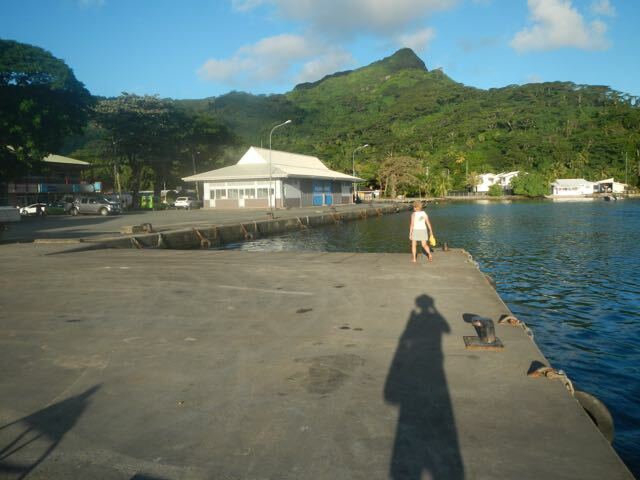 The main village is Fare, which had a great little cruiser's bar called the Huahine Yacht Club. It has good food, cold beer, and that most wonderful attraction, a laundry service for boaters! Woo-hoo! Fare is located just inside the main Pass through the reef. Fare boasts one of the better little supermarkets, a post office, a couple of banks, some small cafes and pensions and not much else. The only visitors for the most part are cruising sailors who anchor just inside the Pass and along the reef edge. 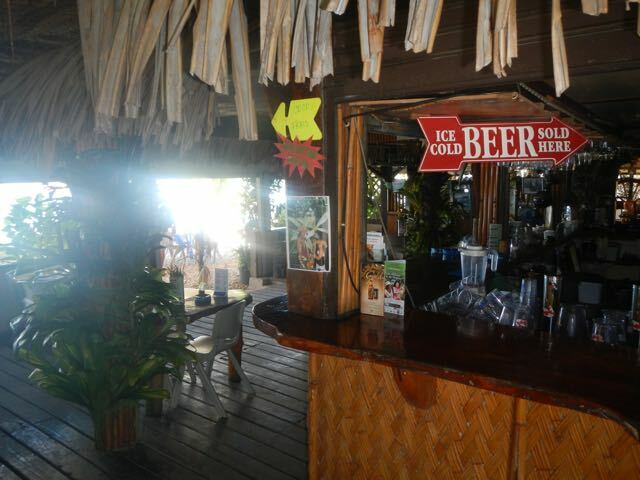 Ah, the fabulous Huahine Yacht Club, really just a cruiser's bar, but they know what sailors like: Ice Cold Beer! 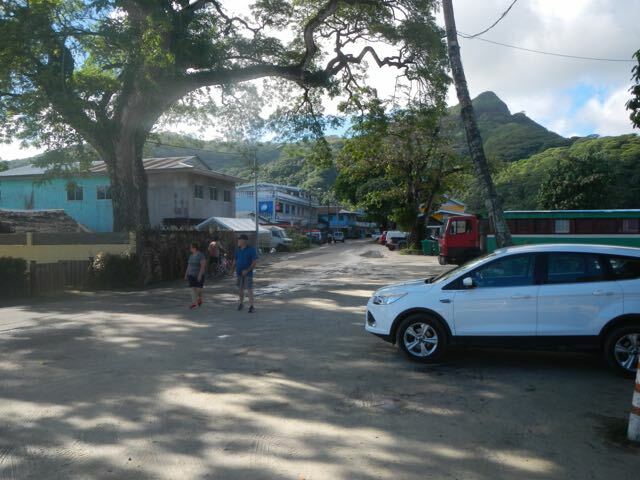 A view down the wonderfully sleepy main street in Fare, the largest village on Huahine Island. 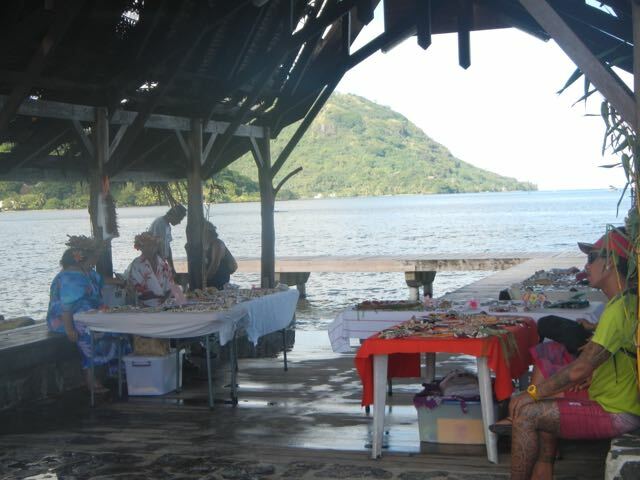 Local ladies showing off their handcrafted jewelry for sale on the dinghy dock in Fare, Huahine Island. Tomorrow is the Fete de la Vanille (Vanilla Festival) so the main square in Fare is being decorated for the occasion. 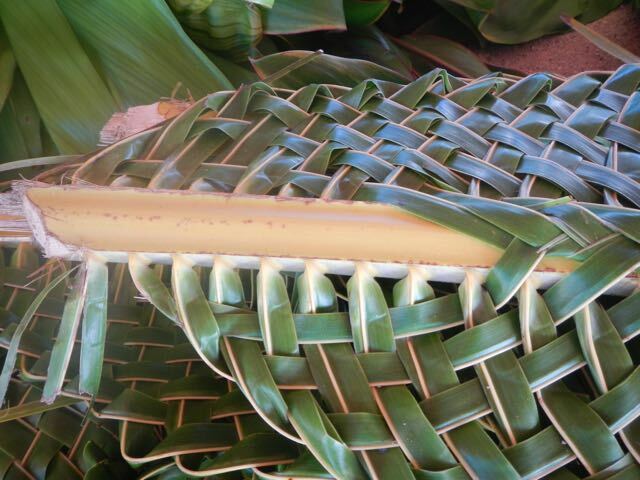 Here is a close-up of the amazing woven coconut palm branches that will be used to adorn the stands for the festival. 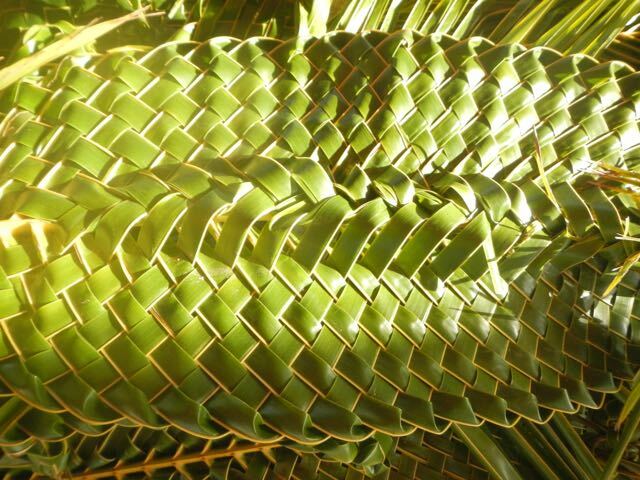 Another close-up showing the weaving technique for the coconut palm fronds. 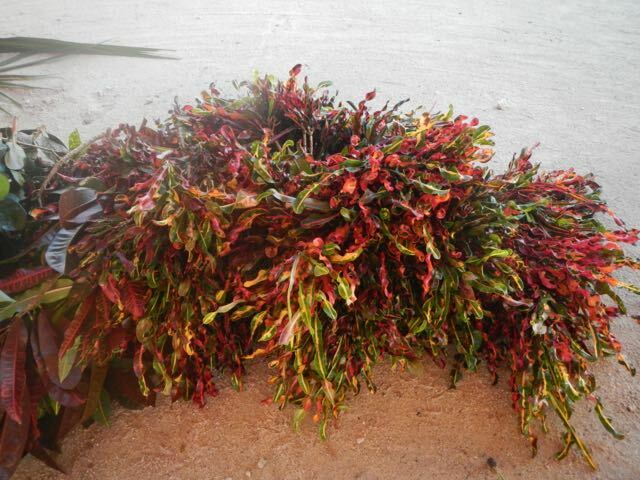 Colorful freshly-cut plants that will be used to adorn the various huts and stands for the festival. 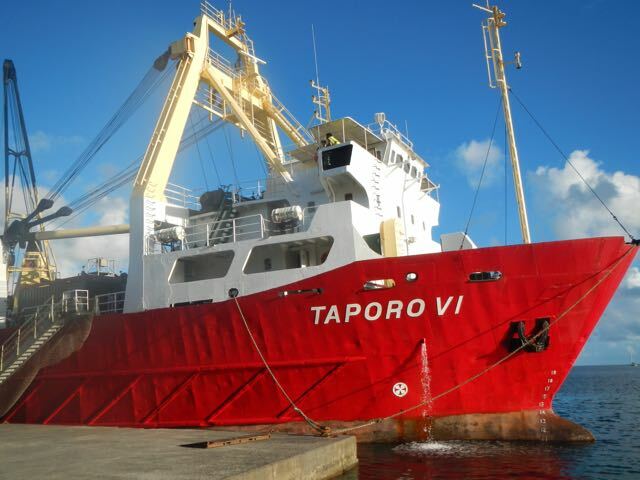 Taporo VI, an inter-island freighter, at the main quay (wharf) in Fare, Huahine Island. We also saw Taporo VI calling at Tapuamu Bay on Taha'a Island last week. This freighter and her sister ships also call at night, weaving their way to the quay in the dark amidst dozens of anchored sailboats and catamarans. Conni strolling the quay right after Taporo VI departed, with Bill's shadow. 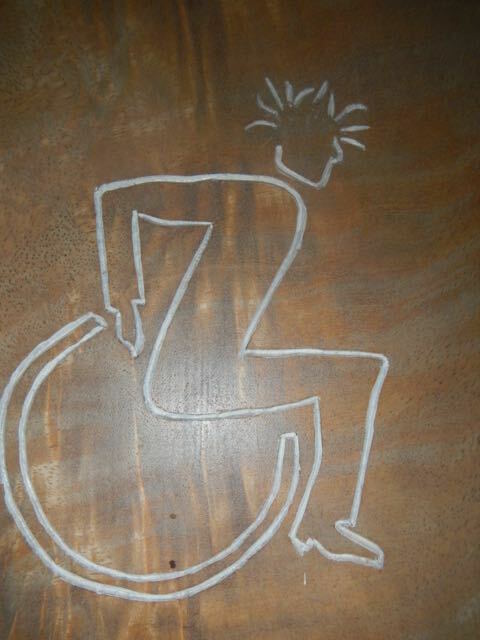 A very cool carved sign for the handicap-accessible public restroom. 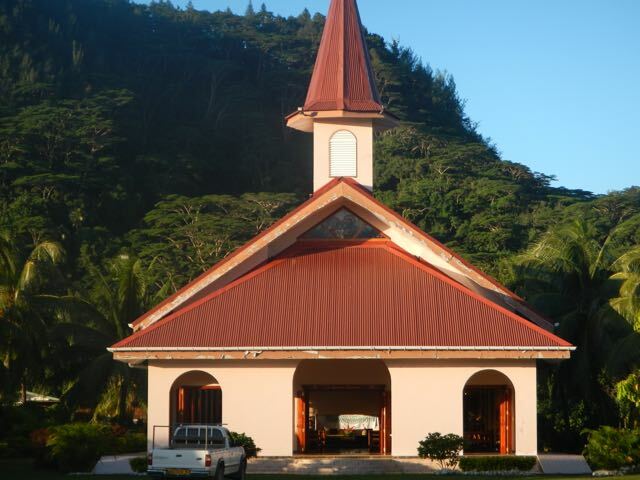 Although most of the Society Islands are heavily Protestant due to the influence of the London Missionary Society in the late 1800s, the French brought Catholicism. Here is the Catholic Eglise de la Famille Sacrew - a namesake to Anchorage's Holy Family Cathedral. Beautiful late afternoon light. Notice that the entire church is open-air. 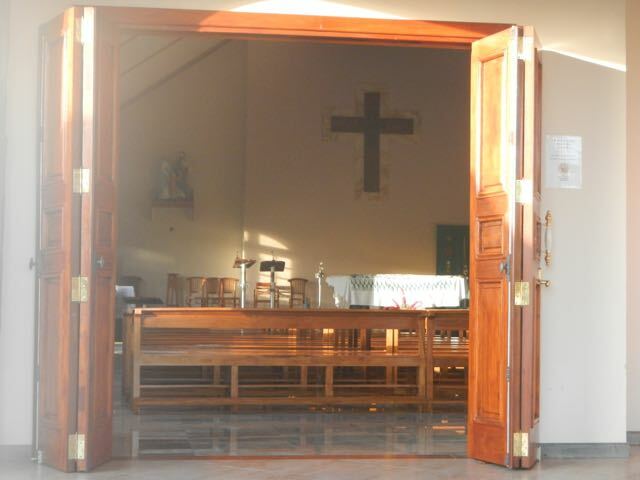 A view into the interior of the small Eglise (church). 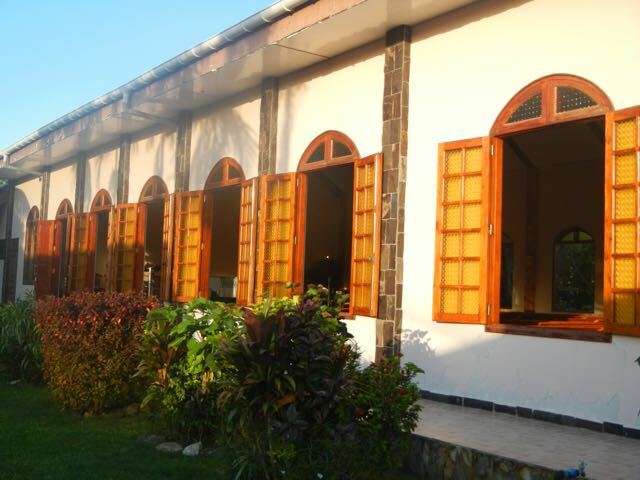 A view of the side garden of the church, with all of the shutters wide open. There is no glass in the windows, but the shutters can be closed in inclement weather. 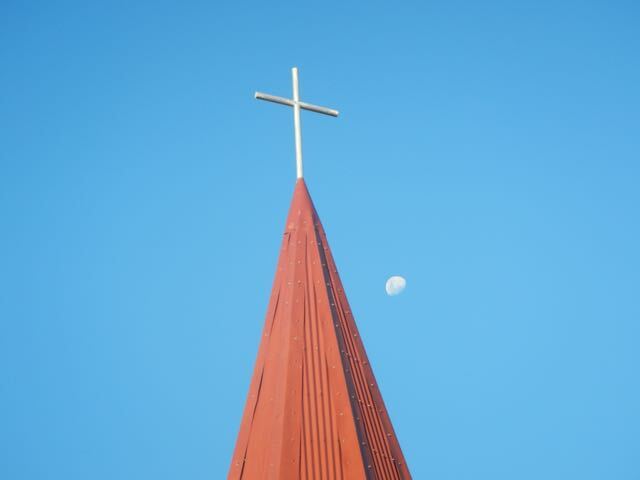 The rising three-quarters moon at about 4 pm showing over the top of the church. Bill appreciated the religion vs paganism motif. This one is for Papa and Toni: a genuine Polynesian "Tiki Bar." 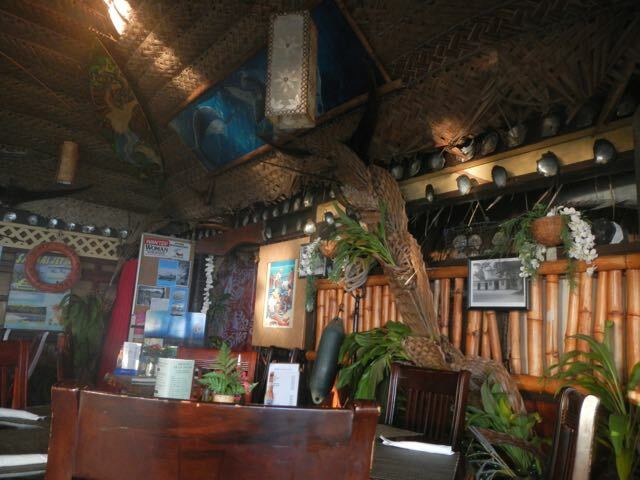 The inside of the dining area of the Huahine Yacht Club. 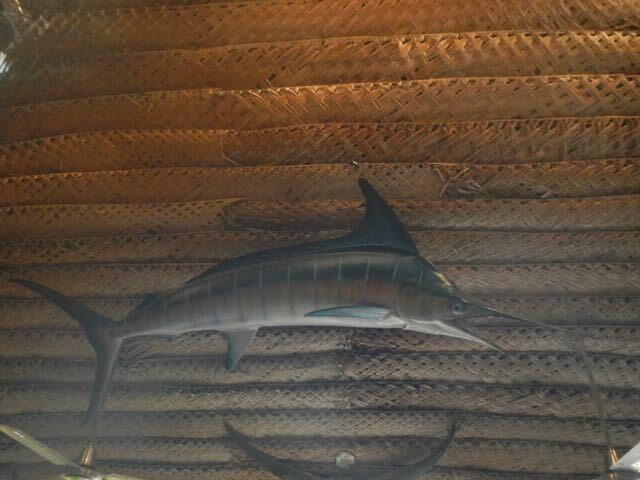 A very impressive (former) Blue Marlin is displayed on the vaulted coconut palm frond ceiling of the Huahine Yacht Club. "Is it here, yet?" 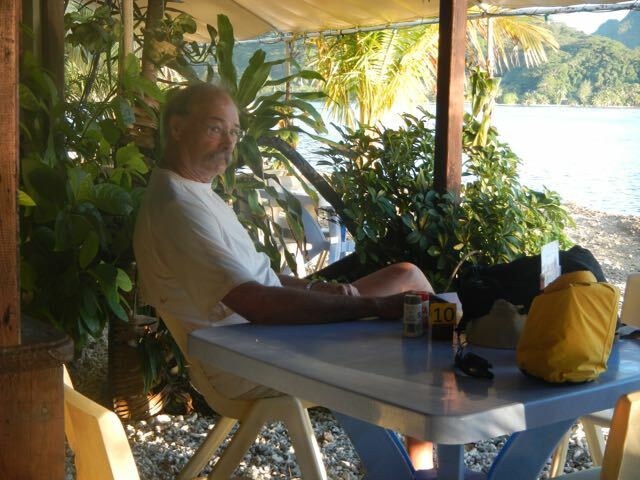 Bill contemplating the imminent arrival of his ice-cold mug of Hinano beer, overlooking the lagoon at Fare, Huahine Island. 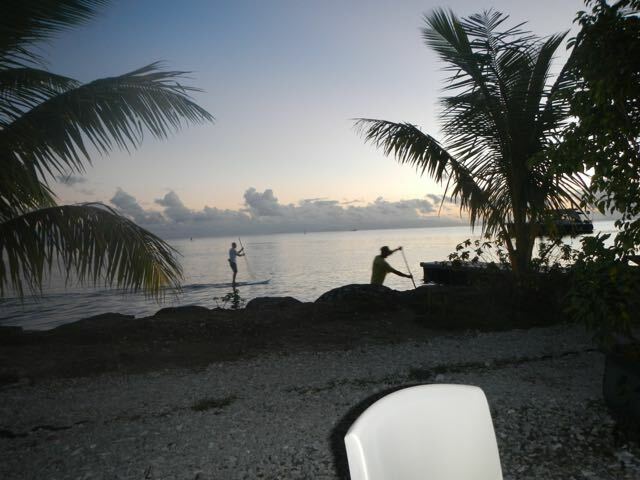 Two guys on stand-up paddleboards framed against the setting sun just outside the yacht club. This was our view from our table. If you look carefully, you can see Raiatea on the horizon. How pretty is this? After the cold beer, a gorgeous tropical cocktail in a gorgeous tropical setting. 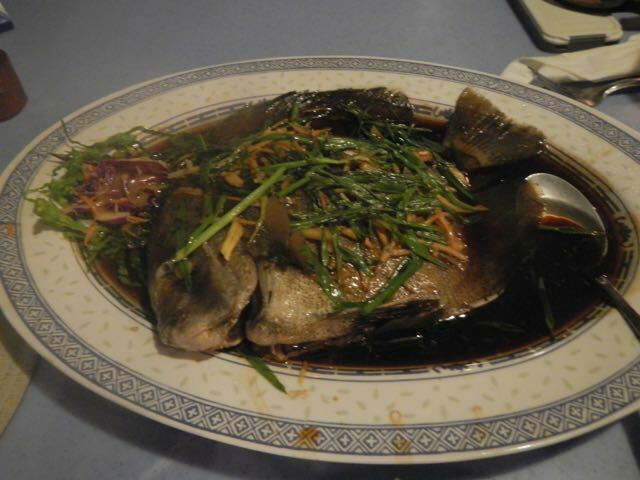 Delicious, freshy caught local fish, poached and served in a teriyaki sauce with lots of green onion and grated ginger. The fish is gutted but otherwise served whole. The Tahitian name is Parahapeue; they said the American name is batfish, a not-so-inviting name for a very tasty dinner. The tail, head and fins were shared with a very sweet cat mother and daughter who miraculously appeared under our feet as soon as the dinner reached the table.